Nine time Grammy Award winning vocalist Janis Siegel, Brazilian multi-instrumentalist Nanny Assis, and Multi-Grammy Nominated pianist John di Martino are each recognized as masters of their craft. 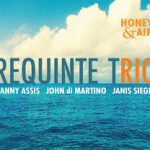 With the Requinte Trio, they each bring their love for American Jazz and Brazilian music together for an exciting fusion of diverse musical worlds. Janis Siegel is well known for her work with the vocal group, The Manhattan Transfer, and as a solo artist. In addition to winning nine Grammy Awards, she has also been nominated seventeen times with a solo career spanning ten albums along with numerous collaborations. Born in Brooklyn, Janis learned about the music industry quickly and frequently went to Broadway shows. She has been singing since the age of twelve and had a young professional career throughout the 1970’s with her group, Laurel Canyon. Now she is recognized through numerous polls as a masterful vocalist, even earning an Honorary Doctor of Music from Berklee College of Music in 1993 and the MAC Lifetime Achievement Award in 2004. Born in Philadelphia, John Di Martino was a student of Lennie Tristano. He has recorded many CD’s with his “Romantic Jazz Trio”. Known for his versatility, he recorded and performed with artists like Kenny Burrell, James Moody, Joe Lovano, Pat Martino, Paquito D’Rivera and Houston Person. He is also sought out as a fine musical director, accompanying vocalists like Jon Hendricks, Diane Schurr, Kelly Smith and Billy Eckstein. The Requinte Trio will be sharing the fusion of American Jazz and Brazilian music, forming “creative combustion” of music. These artists will come together through a common love of lyrical melodies and delicious grooves to create what they call a “musical cocktail” of sorts. They will explore the combinations of beautiful Brazilian rhythms with the influence of American Jazz to make a uniquely creative experience.